Anthony J. Rospert, Esq., and Todd M. Seaman, Esq. Prior to mediations involving complex business disputes, the parties and legal counsel typically exchange offers and counteroffers—often focused solely on the dollar amount involved. The parties and legal counsel may also exchange mediation briefs addressing substantive legal issues. However, legal counsel—and consulting experts—often devote little or no time to understanding the client’s interests and goals, evaluating the case strengths and weaknesses, developing a budget, or assessing settlement options. This discussion provides a practical guide to preparing for mediation and summarizes the best practices for conducting a premediation assessment in order to maximize the likelihood of a successful dispute resolution. The Valuation Analyst—An Independent Expert or a Client Advocate? A valuation analyst may be retained to provide a variety of professional services for a number of different purposes. These professional services are intended to achieve the purpose and objective of the particular engagement to which the analyst was retained. However, regardless of the purpose and objective of the assignment, one responsibility for an individual acting as an independent valuation analyst is to remain independent, objective, and unbiased. This statement is true even if the engagement involves a forensic analysis performed within a litigation support or dispute resolution environment. This discussion considers the selection of a testifying expert in valuation and/or economic damages controversies in connection with a business, security interest, or intangible asset (and intellectual property). The process of identifying, interviewing, and ultimately selecting a testifying expert requires a multidimensional approach on the part of the litigation team. This discussion recommends a decision framework to litigation counsel for purposes of selecting the “right” testifying expert from a “top shelf” slate of candidate experts. The perspective of a practicing attorney is primarily influenced by both historical securities litigation decisions and personal experience. In order to provide a practitioner perspective, this discussion includes thought leadership on the current state of corporate security transactions from a practicing business governance attorney. In the matter of In Re Appraisal of Dell Inc., tried before the Delaware Court of Chancery, dissenters appraisal rights were petitioned by shareholders who held 5.2 million shares following the management buyout of Dell by its founder Michael Dell and by Silver Lake Partners. The Chancery Court concluded that the fair value per share was 27 percent greater than the actual merger price per share. This discussion (1) describes and analyzes the facts of the case, (2) provides a chronological time line of the company sale process, (3) summarizes the Chancery Court’s reasoning for its judicial decisions, and (4) lists—and explains—the judicial precedents cited in the Chancery Court memorandum opinion. This discussion provides a review of certain Delaware Court of Chancery decisions involving dissenting shareholder appraisal rights actions. Specifically, the discussion focuses on three appraisal rights proceedings in which fair value was determined to either equal— or deviate from—the actual merger transaction price. This discussion (1) describes the facts of the cases, (2) explains the Chancery Court’s reasoning behind its decisions, and (3) recommends a conclusion regarding the implications of the merger price in Delaware appraisal rights proceedings. This discussion provides an overview of two recent judicial opinions related to employee stock ownership plan (“ESOP”) installation transactions. While the judicial opinions are specific to the circumstances of the Constellis Group, Inc. (“Constellis”), ESOP transaction and the SJP Group, Inc. (“SJP”), ESOP transaction, these opinions may provide useful insights for prospective ESOP companies and professional ESOP advisers. The following discussion (1) introduces the two lawsuits, (2) provides context for the subject ESOP transactions, (3) lists the arguments that were presented in court, and (4) summarizes the judicial opinions. C corporations and S corporations should pay shareholder/executive compensation based on the fair market value of the executive services rendered—or risk being audited and possibly penalized by the Internal Revenue Service. 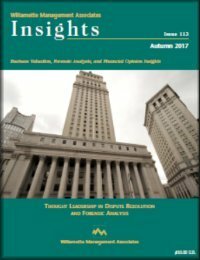 Forensic analysts can help companies determine reasonable shareholder/executive compensation using free or fee-based compensation data, with consideration of statutory authority and judicial precedent. This discussion (1) summarizes the federal income tax statutes and judicial precedents related to shareholder/ executive compensation, (2) provides a list of frequently relied upon executive compensation data sources, and (3) reviews important issues presented in recent judicial decisions regarding shareholder executive compensation. In practice, applying a size premium to estimate the cost of equity capital as part of a business valuation engagement is a generally accepted analytical procedure. Before selecting and applying a size premium, however, the analyst should consider all of the potential issues related to incorporating a size premium in the cost of capital estimation.